Penzance, nestled in the heart of Mounts Bay, is the capital of Penwith and West Cornwall. 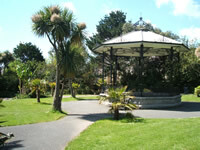 With plenty of history and long standing traditions combined with up to date facilities, shops and transport links, Penzance offers residents a unique place to live and laid back way of life. Penzance (or Pen Sans in Cornish) means holy headland, referring to the headland to the west of the harbour where a chapel was built over a thousand years ago. Historically Penzance has been a market town from 1592. For more information, read the history of Penzance. Modern Penzance had a population fast approaching 30,000 people covering all ages, nationality's and religions. The architecture of the town is predominately Georgian and Regency, but influences of other styles creeping into many of the houses on many of the towns streets. The town is the considered the capital of the Lands Ends peninsula due to the large shopping area with hundreds of retailers and a large proportion commercial businesses of the area. Getting to and from Penzance and the neighbouring villages is easily done via the A30 and the A38 from which the entire length and breadth of the nation is accessible. The railway which reaches to North Scotland and West Wales terminates at Penzance. As such the town acts as the main transport hub for the area. Penzance is also the link between the Isles of Scilly and the mainland, via its harbour and the Heliport at Eastern Green, with services running all year round. Penzance and West Cornwall has a mild temperate climate all year round. This enables the gardeners of the area to incorporate sub tropical plants into their garden designs. For large scale implementation of tropical plants, take a walk through Morrab Gardens, one of the largest outdoor tropical gardens in the UK. The temperate climate allows Cornish producers to harvest their crops before most of Europe, and flowers can be seen early into the year.